Share the post "Emotion and Success at the Gala Dinner of Projet Cœur 3 Etoiles"
This three-day sports event and gourmet gathering, was organized to raise funds in favor of the ELA association whose aim is to fight leukodistrophies and provide affected families with essential support. After having met Theo Mathys, a little boy from Wallis suffering from leukodystrophia, a group of volunteers presided over by former Swiss Football Champion Christophe Bonvin, decided to join their collective skills to organize a unique event in favor of Theo and of the ELA association in Switzerland. On Friday April 20th, on the theme “PUT ON YOUR TRAINERS AND FIGHT THE DISEASE!”, school students from age 10 to 20 ran in a great fundraising race at the Tourbillon Sports Center in Sion, under supervision of Zinedine Zidane and other sports stars. On Saturday April 21st, Grimisuat municipality and Football Club hosted a friendly football game with the participation Swiss ex-football stars. The Gala dinner « A Taste of Hope » was held at Les Roches on Sunday, April 22nd, gathering over 200 guests to enjoy a delightful banquet. For the event, two stars of Swiss gastronomy, Gérard Rabaey – Three Michelin stars and 19/20 in the Gault et Millau guide – and Aldo Coppey, assembled a team of five famous Chefs: Jean-Marie Théler from the Coq en Pâte, Stéphane Decotterd who took over the Pont de Brent from Gérard Rabaey, Pierrot Ayer from le Pérolles, Jacques Bovier from la Sitterie and Damien Germanier from le Botza. 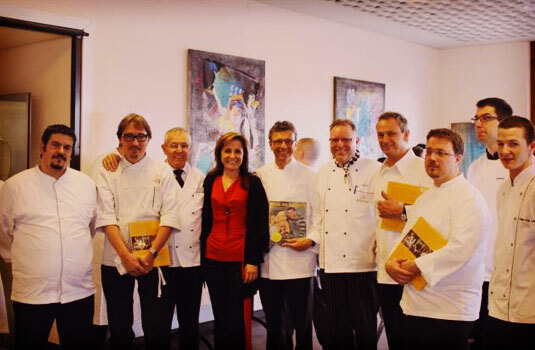 With the help of our students, they prepared an elegant and creative menu in Les Roches’ kitchens. All five dishes were served by our students to the guests in the Market Place restaurant room, set up for this occasion to look its very best. On this occasion, Les Roches was honored to welcome the R’n’B singer Amel Bent, Mikelangelo Loconte, singer in the musical Rock Opera Mozart, both patrons for ELA, as well as former Swiss Federal Counselor Samuel Schmid, Guy Alba founder and president of ELA France, former ski champion Pirmin Zurbriggen, and local personalities such as Leonardo Gianadda and Jacques Melly. An auction at the end of the meal offered highly desirable objects, such as Cristiano Ronaldo’s football shirt signed by all the players of the Real Madrid, an Arsenal football shirt signed by the whole team, the platinum record of the Mozart Rock Opera, ski champion Didier Défago’s helmet, and last but not least the racket with which Noval Djokovic won the Australian Open. The bids hit the roof and the objects were sold at high prices, exceeding expectations in favor of ELA Association and in favor of little Théo and his family.